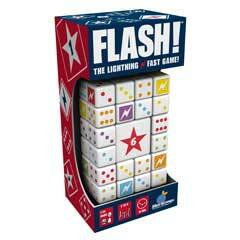 Watch the sparks fly in this lightning-fast dice dash! Players race to complete eight challenges of dice combinations and try to rack up the most points. Flash is the go-to game for electrifying fun. Straightforward and quick, you can go at it again and again. Everyone of all ages gets bit by the competition bug and has a fair shot to victory. Everyone gets 6 dice. Someone picks a challenge for the round. On the count of three, everyone starts to roll...and roll, and roll again, keeping the dice they like and trying again with the others until they achieve the combination. Roll a lightning bolt and you strike lucky as it can be any number you wish! Collect the highest chip available once you've finished the dice dash. Move on to the next challenge and play through all 8 rounds. If you're feeling like fortune is on your side, play Freestyle Flash and choose your challenge as you go! The travel pouch makes it the ideal game for electrifying fun on the go. Includes 36 dice, 6 score chips, a scoring pad, and a travel bag.